What Caused the Russian Revolution? A century later, historians still disagree about what caused the Russian Revolution. On February 23, 1917, an unseasonably warm day, women at the Vyborg cotton mills in the Russian city of Petrograd (formerly St. Petersburg) marked the recently created International Women’s Day. The meeting became a mass walkout; as the women headed for the Neva River, other people—men and women—joined their ranks. By noon, about 50,000 protesters were participating in a spontaneous strike. The police boarded streetcars, expelling anyone with calloused hands, and blocked the bridges across the frozen river, but the workers walked across the ice. The next day, nearly 75,000 people were on strike. Czar Nicholas II sent Cossack horsemen to put the rebellion down, but they simply cantered through the crowds without using their swords or whips; they had chosen not to fight the people. Workers flocked into Petrograd for a three-day general strike. Demonstrators in homemade helmets and padded jackets waved red banners demanding an end to Russia’s involvement in the world war. When police arrived, the Cossacks defended the protesters. As its members hadn’t been elected, the Duma committee had no claim to democratic authority, and it was clear that workers felt a greater allegiance to the Soviet. The people, most of whom had little understanding of the finer points of Marxism, wanted socialism, and quickly. From his exile in Zurich, Lenin expressed his disgust at the new arrangement. He sent a telegram to his Bolshevik comrades, declaring: “No trust in and no support for the provisional government. Kerensky especially suspect; arming the proletariat is the only guarantee…no rapprochement with other parties.” Lenin was virtually alone in his insistence that power pass into the hands of the workers immediately. For a few brief months, Russia became one of the freest countries in the world. The provisional government granted amnesty to political prisoners, abolished the death penalty, banned flogging in prisons, ended the practice of deportation to Siberia, and dissolved the czarist secret police. It proclaimed equal rights and legal status for all nationalities and religions, ending the Jewish Pale of Settlement, and granted unlimited freedom of the press and public assembly. Russia remained a nation at war, though the war had been the catalyst for revolution and peace was one of the primary demands of the strikers and demonstrators. The provisional government, the Petrograd Soviet, and others argued over whether the country should continue fighting the war—and, if so, on what terms. Many of the socialists had abandoned pacifism, insisting that the war had to be won and the motherland defended, and that allies could not be abandoned. Here again, Lenin was in a tiny minority. He had long called for an immediate end to the war. It was, in his view, “a struggle for markets and for the freedom to loot foreign countries,” and its effect was “to deceive, disunite and slaughter the proletarians of all countries by setting the wage-slaves of one nation against those of another so as to benefit the bourgeoisie.” But it wasn’t peace that Lenin had in mind when he called for Russia’s disengagement. Instead, he was plotting a civil war, the next step on his road map to international communism. One hundred years after the Russian Revolution, historians are still arguing about what made this seismic political shift possible. For the most part, the crises, reversals, and surprises, along with the long strings of names, places, and deaths, are consistent from one account to another. But different historians—often with distinct political allegiances—offer very different answers to the question of why many of these events happened in the way they did. 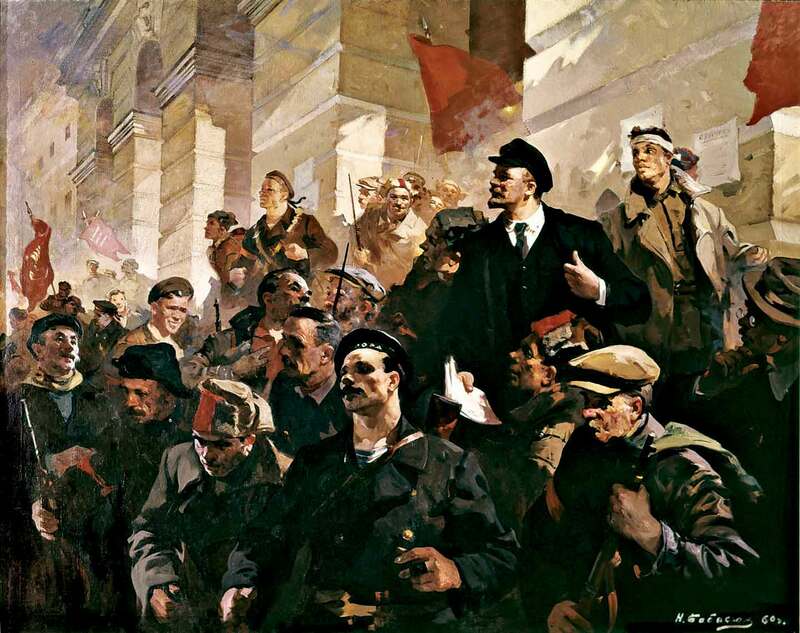 How historians narrate the story of the Russian Revolution tells us much about their philosophy of history, as well as about their attitude toward the revolutionary project and the politics of the left. As its title suggests, Catherine Merridale’s Lenin on the Train places Vladimir Ilyich at the center of the narrative, building toward his arrival at the Finland Station in April 1917. When Lenin, who had been living in Western Europe for 17 years, received the news of the February Revolution, he was desperate to return to Russia. It wasn’t easy: Britain and France, which were relying on their alliance with Russia, had no wish to help a fierce opponent of the “imperialist war” return home. Lenin found that his only viable route back was through Germany, Sweden, and Finland, but traveling through Germany would leave him vulnerable to accusations that he was on the German payroll. Churchill’s image of Lenin is clearly linked to his loathing of communism, the red plague. But the notion of Lenin, or communism, as a bacillus betrays a willful blindness to the larger constellation of factors that make profound social change possible. Merridale acknowledges as much in her book, but her narrative is nevertheless structured on the idea that Lenin brought with him a new social and political world. Lenin on the Train is often engaging and evocative, but as historical analysis, it is not entirely satisfying. Lenin was not Zeus, with the revolution bursting, fully formed, from his head. Charismatic, gifted, passionate, and ruthless though he was, Lenin was only one man, and one man is not enough to foment or sustain a revolution. McMeekin’s Lenin is neither brave nor diabolically clever; his main characteristic is unscrupulousness. The story of the revolution is not the story of a terrifyingly powerful Lenin, but rather of the failure of the czarist administration and the provisional government to kill him and other key revolutionaries. It is also the story of the disastrous decision by Russian liberals to convince Nicholas II to enter what would become the First World War. McMeekin’s account of the longer-term causes of the Russian Revolution also deviates from the standard narrative. He argues that the growth of revolutionary tendencies was not primarily the result of autocracy, Russian economic backwardness, the land question, labor politics, or socialist theories. In the early years of the 20th century, McMeekin writes, Russia was expanding its territory, modernizing, and increasing its population at breakneck speed; he compares it to China in the 21st century. Though the lot of the Russian worker was difficult, it was nevertheless comparable to that of workers throughout Europe. Russia was unusual only in that it had few intermediary institutions to buffer popular resentment of the czar. The famous bread shortages of Petrograd in the winter of 1917 were “mostly mythical.” Drawing on newly discovered archival sources, he even argues that in 1916–17, morale in the army was on the rise, and that Russian soldiers were better fed than their German counterparts. McMeekin also points out that the czarist secret police was small, though very efficient, and rather lenient. The death penalty was meted out rarely—in some cases, not even to political assassins—and most revolutionaries were sent into administrative exile, where they were free to work and agitate, albeit in Siberia. Exiles received a living allowance for clothes, food, and rent, and they could bring along family members or hire domestic servants. (Lenin brought his wife and mother along and hired a maid when he arrived.) Nothing was inevitable, in this telling; the tide could have turned at any moment. The Bolsheviks’ victory was brought about by Lenin’s skillful but risky effort, at a moment of Russian vulnerability, to transform the “imperialist war” into a civil war by infiltrating the armed forces and “turning the armies red,” spurring mutinies and mass desertions by soldiers who took their weapons with them. Upon his arrival at the Finland Station, Lenin was virtually alone in his insistence that society was already passing to the second stage of the revolution, when power would be placed in the hands of the proletariat and the poorest peasants. At the time, even many of his fellow Bolsheviks thought this was madness: There was no way that Russian workers were ready to form a dictatorship of the proletariat. But Lenin was unrelenting and, with his gift for oratory, he was able to persuade many ordinary people that he was right, turning them against the provisional government. Protests and counterprotests exploded into violence. Lenin’s refusal to compromise with the provisional government or the pro-war “revolutionary defencists” made the Bolsheviks the only political party offering an alternative to dual power, which came to seem like a form of impotence or treachery in its failure to end the war, food shortages, and general disorder. Lenin’s liability was his history of German support, which Kerensky and others tried to use against him. (Indeed, throughout the Russian Revolution, Germany continued to send large sums to the revolutionaries.) Accused of treason and espionage, Lenin fled to Finland in July, and many of his comrades were imprisoned. Meanwhile, the foolish, foppish Kerensky unwittingly smoothed the way for the Bolsheviks, remaking himself as a dictator, moving into the Winter Palace, sleeping in the czar’s bed, and traveling in the czar’s train carriage. He reinstated the death penalty in an effort to get the armed forces under control, provoking much outrage. After an absurd series of scandals and intrigues involving his own generals and officers, Kerensky released most of the Bolshevik prisoners, whose comrades had already made substantial progress in indoctrinating the rank and file of the army and navy. In September, the Bolsheviks won a major electoral victory, a sign of their surging popularity. In October, Lenin returned to Petrograd in disguise and argued forcefully that the Bolsheviks should seize power before the November elections. He feared that the Bolsheviks would never be able to win an election that included peasants, who were much more likely to support the Socialist Revolutionary Party than urban workers were. Lenin’s arguments prevailed, though Trotsky managed to delay the seizure of power so that it happened two weeks later, on the day of the next meeting of the Second Congress of the Soviets. The planned coup was an open secret: Kerensky begged the British to help him negotiate an armistice in the war, understanding at last that peace offered his only hope of remaining in power. In the early hours of October 25, 1917, armed Bolsheviks approached cadets guarding key choke points in Petrograd and told them that they were being relieved. Other Bolsheviks walked into the Central Telegraph Office and disconnected the phone lines to the Winter Palace. Kerensky sent a telegram summoning two Cossack regiments, but they refused to come to his aid; they were loyal to a general whom Kerensky had accused of treason. That same morning, Kerensky escaped Petrograd in a US embassy car. The Bolshevization of the armed forces had paid off, giving Lenin and his comrades the muscle they needed to finish off the Kerensky government. Banks refused to release funds to the Bolsheviks; Lenin’s commissars began taking bank employees hostage and demanding ransom. It was largely to break the bank strike that the Bolsheviks formed the All-Russian Extraordinary Commission to Combat Counterrevolution, Speculation, and Sabotage, better known as the Cheka, predecessor to the KGB. The Cheka was also responsible for containing the damage done by the Bolsheviks’ defeat in the November 1917 elections, in which the party won only 24 percent of the vote, as opposed to 40 percent for the Socialist Revolutionaries, who had indeed maintained the loyalty of the peasants. The unfavorable result was explained away with allegations of electoral abuse and fraud, while the Cheka closed the Tauride Palace to prevent the opposition from gathering there. The Bolsheviks’ abandonment of democratic principles and their cavalier approach to coercion and violence played a central role in their victory, at least over the short term. McMeekin’s focus on historical contingency and Bolshevik ruthlessness suggests that revolution is less about large-scale historical processes and more about cold-blooded political opportunism. At times, his adamant rejection of historical determinism looks like an overcorrection for Marxist orthodoxy. No revolution is inevitable, but it feels perverse to minimize longer-term factors so energetically. McMeekin’s insistence that czarist Russia was doing well economically, and that workers and peasants had no more reason for complaint than their Western European counterparts, bears an unpleasant resemblance to today’s attempts to dismiss the economic and social grievances of the masses with statistics showing that the economy is still expanding. McMeekin displays plenty of sympathy for the murdered czar and his family, but less for the millions of Russians who suffered under the czarist regime. S.A. Smith’s Russia in Revolution takes a more familiar line than McMeekin’s, linking the origins of the revolution to czarist abuses. Smith emphasizes the agency of ordinary people in determining the trajectory of Russian history, devoting particular attention to workers, who did so much to further the revolution, and to the peasants, who rose up against the old order and then rebelled against the new one. Smith marshals extensive economic, social, and cultural evidence to help explain the nature of the social transformation that led to the revolution and then to the Soviet order. Rejecting the Western tendency to see 1917 as the precondition that made the nightmare of Stalinism inevitable, Smith reminds us of the inspiring hope of socialism, the justified rage at an unjust order, and the roads not taken that might have led to a happier result. For Smith, the February Revolution was the result of a crisis brought about by economic and social modernization and aggravated by the world war. Even as Russia attempted to keep up with the rest of the world—and maintain its status as a great power—the social system underpinning the autocracy was eroding with the emergence of new classes like industrial workers and a professionalized middle class. While McMeekin stresses the economic gains under Nicholas II, Smith focuses on the suffering caused by the demands of wartime, which angered the workers as well as a peasantry already disappointed by earlier land reforms. In Smith’s view, the failure of Russian democracy in 1917 is best explained by the willingness of moderate socialists to continue the country’s involvement in World War I, in keeping with their belief that the bourgeoisie was next in line for political power. Workers and peasants were told to wait their turn. It wasn’t a surprise that these latter groups welcomed the more radical Bolshevik position. Smith takes pains not to cast the Bolsheviks as the only perpetrators of violence in the revolution and ensuing civil war; the White armies, nationalists, peasants, and anarchist bandits also committed atrocities. In times of social disintegration, displacement, and starvation, mass violence is a familiar result and should not be viewed as the inevitable outcome of a socialist revolution. Rather than seeing Stalinism as predetermined by the Bolshevik seizure of power, Smith argues that after the Bolshevik regime began to stabilize Russian society, it veered back toward the violent, antidemocratic czarist order, itself a product of the country’s distinctive geography, lack of capital, bloated bureaucracy, and religious and peasant traditions. Stalinism was thus the deformed offspring of Marxism and Russian political culture, warped by larger social, economic, and political factors that often had little to do with ideology. Perhaps the hardest thing to understand about Lenin and the Bolsheviks is their insouciant attitude toward mass death, despite their adherence to a utopian philosophy that sought to eradicate human suffering. Smith explains that Lenin’s philosophy was far from a pure Marxism; it was rooted in the nihilist-terrorist strain of Russian revolutionary thought as well as the millenarian ideas that were popular in Russia at the turn of the century. Lenin did not seek to make the lives of those already living better; he believed that revolution would cleanse the world of injustice and create an entirely new society. The lessons of 1917 also testify to the risks that accompany any political position that sees progress as a by-product of history. The movement from capitalism to socialism (and vice versa) is not inevitable and can be reversed; teleological thinking leads to strategic blunders and gross misinterpretations of reality. Still, politics and economics have their patterns; if these patterns can be understood, they can be adjusted or controlled. After a long banishment, Marx is returning to mainstream political discourse, as a new generation discovers that many of his observations about the predatory logic of capitalism still hold startlingly true. Sophie PinkhamSophie Pinkham is the author of Black Square: Adventures in Post-Soviet Ukraine. She is completing a dissertation at Columbia University on contemporary Russia’s search for a national idea.